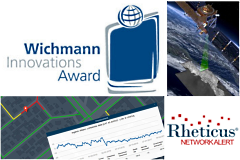 Rheticus®, Planetek Italia's cloud-based satellite monitoring platform, was awarded as the best software at the Wichmann Innovations Award 2018. The only Italian to compete in the "software" section, the Rheticus® platform has been selected for its continuous satellite monitoring service of landslides, subsidence and stability of the infrastructures, with millimeter precision. To its subscribers and decision-makers Rheticus® offers dynamic and immediate information, simplifying the complex analysis of satellite data now accessible even to non-expert users. The award ceremony was held during the INTERGEO 2018, the most important international fair in the geospatial sector, to which Planetek Italia was present with an exhibition space jointly with its partners Hexagon GeoSpatial and Geosystems GmbH.